Just Julie B's Stampin' Space: Merriest Wishes Tags & Gift Box Set! Gift packaging is something we need throughout the year, especially during the holidays! This gift box is designed to include four individual compartments, just perfect for the Merriest Wishes gift tags. The tutorial also includes four gift tag designs. 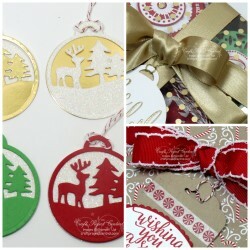 The tags can be easily customized to your favorite colors, images, or greetings, from the Merriest Wishes/Merry Tags Bundle. Just make four of each design and you will have sixteen beautiful tags to give to that special person this year. Or, you can leave off the divider and fill the Gift Box with candies! The Gift Box containing the candy uses Candy Cane Christmas and Candy Cane Lane Designer Series Paper. This super pretty project was made by Jari Francis and you can get her tutorial when you subscribe to the month of October over at Craft Project Central.